Also included: Gilles Chanteperdrix passes, corporate Linux, Cisco patches against the NSA, MariaDB’s proprietary moves, Netrunner becomes Maui, Ubuntu to replace Upstart, Fedora and Wayland, and Linux client for Yandex Disk. The last LinuxCon: This year’s LinuxCon, held in the city of Toronto which is one of my favorite old haunts, was the last love fest for Linux under the name LinuxCon, which had come to be synonymous for a certain type of Linux festival. In a way, it’s fitting this should be the last as the show ended on the day before Linux’s 25th birthday and was, in many ways, a celebration of the first quarter century of Linux. In another way it’s a crying shame. LinuxCon has come to stand for the community spirited nature of Linux, even though backed by the Linux Foundation, which becomes less of a community organization with the passing of each year. 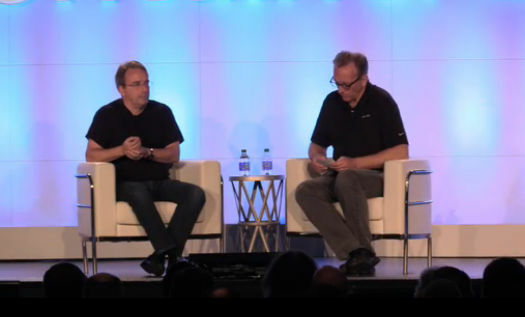 Linus Torvalds being interviewed by VMware’s Dirk Hohndel on the last day of the last LinuxCon North America. Next year’s event in Los Angeles will be renamed Open Source Summit. Next year’s LinuxCon-that-won’t-be-LinuxCon will be held in the City of the Angels, that would be Los Angeles for those of you who don’t speak English, another of my old haunts even though I haven’t lived there since it was one of the least expensive cities in the United States — and yes, I’m that old. The new name? Going forward it’s going to be called Open Source Summit. Meh. How boring. We’re assuming the name change will also apply to the other LinuxCons the Linux Foundation holds across the globe beginning next year. Why the change? Something to do about how the event isn’t just about Linux anymore, as if it ever was. Even Linux isn’t just about Linux. It’s about Linux and the software that runs on it, which is what LinuxCon has always been about. In an open source world, I think it would be a fine idea for someone to start a community spirited conference and fork the name. Whether the Linux Foundation would allow that to happen, of course, depends on how much the people running the foundation really believe in open source. Just between me and you, I have my doubts. Corporate Linux: While we’re on the subject, the Linux Foundation takes Linux more corporate with each passing year, which probably doesn’t come as much of a surprise. The foundation recently published the “23th Anniversay Edition” of its annual Linux Kernel Development report (PDF), which reveals that only 7.7 percent of code contributions are from people known to have no corporate affiliation. Another 6.8 percent come from people whose corporate connections are unknown. So who’s contributing the code? 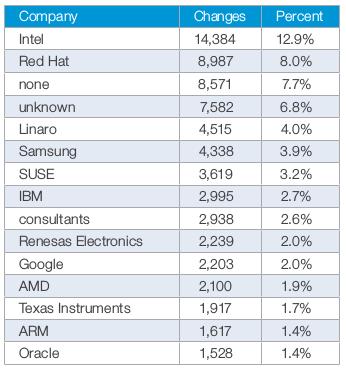 Intel is the top contributor at 12.9 percent, followed by Red Hat’s 8 percent. Microsoft, which a few years back was reputed to be a major contributor to Linux, doesn’t even make the top 30. Is this a good thing? Depends. If you’re an enterprise developer, undoubtedly. If you’re an advocate for free tech, not so much. Cisco patches against NSA: Cisco’s Adaptive Security Appliance firewalls, which typically run on an assortment of open source software, are being patched to keep the NSA at bay. We learned of this on Friday from Lucian Constantin with InfoWorld, who tells us this is to thwart an exploitation tool, ExtraBacon, that’s tied to a group the security industry is calling Equation which is believed to be an NSA cyberespionage team. MariaDB’s proprietary moves: It seems that MariaDB, which was going to save open source from from Oracle’s control of MySQL, has lost its open source luster. It seems that Monty Widenius has decided to monetize the database by turning it into something of an open core product. MaxScale, the database’s proxy software that’s important for deploying the DB at scale, is proprietary as of the recent 2.0 release. However, the license does allow free use with less than three database servers. Passing notes: The people with the Xenomai project are mourning the loss of a longtime maintainer, Gilles Chanteperdrix, who died on August 7 at the age of 41. Another day, another distro: Netrunner, which was based on Arch Linux, has changed its name to Maui and is now based on KDE Neon. Maui 1 “Aurora” is now available for download. Quick takes: In a move that certain to generate some…er, discussion, Martin Pitt has announced that Canonical plans to replace Upstart with systemd.… If all of the bugs can be worked out, the upcoming Fedora 25 will ship with Wayland as default, but users will still have the ability to fall back to Xorg. Parting shot: SaaS marketers seem to be catching on to the fact that desktop Linux users just might very well be a market they want to include in their plans. We told you a few weeks back about Tresorit, the encrypted online storage company that offers a Linux desktop. Now, Yandex, the company that want’s to be Russia’s Google has come out with a Linux client for Yandex Disk, its answer to Google Drive. Blogger DarkDuck has taken it for a test drive and says it not bad. There are 2 versions of Netrunner, one is the “normal” Netrunner (previously based on Kubuntu) and “Netrunner Rolling” based on Arch/Manjaro. So does that mean now somebody’s going to have to fork MariaDB? Thad you do have to ask why would someone fork MariaDB now. Postgresql using BDR and XL that are working on being mainlined provides the cluster replication. MaxScale of MariaDB is in the class of slony for Postgresql that does not perform that great. Postgresql has long list of issues using non mainlined replication that are lining up to disappear for good. Really from my point of view I don’t know what developers behind MariaDB are attempting to-do close source MaxScale. What attempting to make more solutions use postgresql? You do have existing mysql forks like facebooks WebScaleSQL. So I don’t think MariaDB will see new forks by current action but existing forks and alternatives could eat into its market share.